2 Pools, tennis courts, play area available in the summer. Hot tub and Sauna all year. 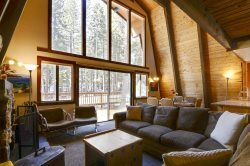 This simply furnished and appointed 2 bedroom townhouse is a wonderful place to begin your Tahoe adventure. On the entry level is the fully equipped kitchen, half bath and open living/dining room with new flat screen TV and gas fireplace. The back entry door opens to a private deck from which you can stroll along the lawn and landscaping to the pool and tennis courts. Upstairs are two bedrooms - one with a queen and the second bedroom has 2 singles. The full bath with tub/shower is upstairs also. The Lake Forest Glen complex offers 2 swimming pools and tennis courts in the summer and a hot tub and sauna all year round, along with many other amenities for you and your family to enjoy! This unit is just a short stroll away from a public beach and the bike trails. The complex is centrally located about 3 miles east of Tahoe city. What a carefree home-base for your vacation! The host was friendly and responded quickly. The house was spacious, clean, and well-located within Tahoe City. We had a great time!